Cross Country stocks welding tents and canopies from Bell Tents and EZ-UP. Bell Tents fit pipe up to 42". Designed specifically for pipeline welders, these versatile welders tents feature fire-resistant, tearproof nylon laminated covers. Units feature strong, lightweight, welded tubular frames that withstand high winds, rough use, yet they assemble in minutes. Skid rails protect cover, strengthen legs, make loading easy. Drawstring on nose cone adjusts to pipe. 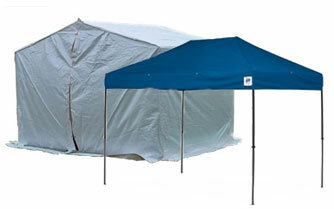 Identical end (with entrance zipper) can be used for total enclosure in extreme cold. Identical halves are joined by sturdy hinges at top. This allows sides to swing together for easy handling. Sections can nest together for compact storage and shipment. EZ-UP canopies provide a variety of shelter and enclosure options in a compact package, easily deployable by one person. Call our at 303-361-6797 for available models and features.